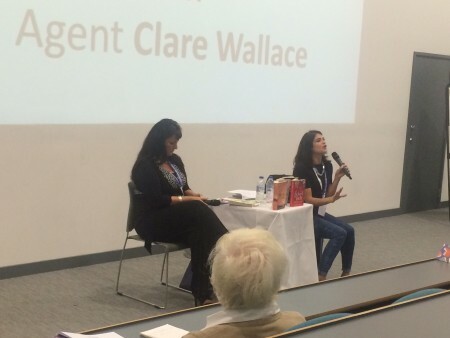 My agent, Clare Wallace, and I travelled down to Plymouth at the weekend to take part in the Literature Works inaugural New Writers Conference at Plymouth University. The event was well attended by writers, with the itinerary packed with tips and advice from authors, agents and editors. Clare and I spoke to delegates about getting an agent and a publishing deal. We included an exciting live submission session where writers volunteered to read out their work and got valuable on-the-spot feedback. Events like the New Writers’ Conference can really help to inspire and drive a writer through the tough times, when patience and self-believe are often tested to the limits. It is helpful to view the time and money involved in attending as an investment in your writing future, providing a much needed injection of inspiration and fresh ideas. Because keeping going is what matters in this game; driving through the inevitable disappointment and difficulties is what will get you there. Feedback from participants has been great and I wish everyone who attended the very best of luck in their own writing journey.